Acupuncture is an ancient Chinese natural therapy that helps to balance the body’s energy fields. When the body’s energy flow is disrupted, it can lead to all types of health problems, sickness and disease. 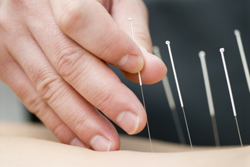 In conjunction with your chiropractic care, acupuncture can enhance your body’s natural ability to heal itself.